On Nov. 11, the Catholic Church lost a moral titan in the long struggle for racial equality and justice in the United States. The life of Mary Antona Ebo, F.S.M., should be noted and mourned by all Catholics concerned with fighting white supremacy and building more inclusive communities. Although her name may not be as recognizable as those of Servant of God Mary Lange, Venerable Henriette Delille, St. Katharine Drexel or the indomitable Sister Thea Bowman, Sister Ebo, during her 93 years, broke a host of seemingly insurmountable racial barriers within the church. A member of the Sisters of St. Mary (later the Franciscan Sisters of Mary) for 71 years, she was also one of the most visible links between Catholicism and the modern civil rights movement. On Nov. 11, the Catholic Church lost a moral titan in the long struggle for racial equality and justice in the United States. In 1965, Sister Ebo—then a 40-year-old nurse and the director of medical records at St. Mary’s (Colored) Infirmary in St. Louis, Mo.—cemented her place in U.S. history when she traveled with an ecumenical delegation from St. Louis to Selma, Ala., to demonstrate in support of black voting rights. 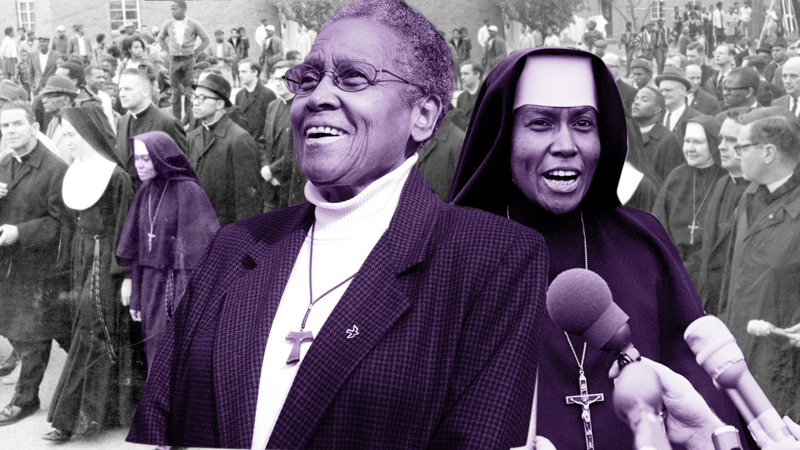 As the only black nun in the interracial group and the first of two black sisters who marched in Selma, Sister Ebo’s presence drew a surprising amount of attention. While histories of the Selma protest and tributes to Sister Ebo’s life have generally ignored her impromptu declaration of black pride, it said more about her journey than most have realized. For as much as Sister Ebo’s statement was rooted in celebrating her family’s survival of chattel slavery (Ebo’s ex-slave grandfather took the surname of his known African ancestors following emancipation), it was also deeply influenced by her life under Jim Crow segregation. Indeed, long before the savage violence of “Bloody Sunday” called her to Selma, Sister Ebo endured a lifetime of hardships marked by great personal tragedies, crushing poverty and virulent antiblack racism. Before she was Sister Mary Antona, she was “Betty.” On April 10, 1924, Elizabeth Louise Ebo was born to Daniel and Louise (Teal) Ebo in Bloomington, Ill. When she was 4 years old, Ebo suffered her first major tragedy when her mother, then just 29 years old, died during pregnancy. The Ebo family suffered another devastating blow a few years later during the Great Depression, when Daniel lost his position as a janitor at the local public library. Unable to support his children or make mortgage payments on the family home, Daniel eventually placed Ebo and her two siblings in the city’s McLean County Home for Colored Children, where Ebo lived on and off from 1930 to 1942. Though raised Baptist, Ebo was drawn to Catholicism during two extended hospital stays in her adolescent years, first at St. Joseph Hospital in Bloomington, Ill., administered by the Sisters of the Third Order of St. Francis, and later the Fairview Sanatorium in Normal, Ill. Intrigued by the spirituality of the kind lay workers at St. Joseph, Ebo requested to receive religious instruction from a visiting priest while she was hospitalized with tuberculosis at Fairview. She soon was received into the Catholic Church. Sister Ebo’s impromptu declaration of black pride said more about her journey than most have realized. Following her recovery, Ebo became the first African-American admitted to Holy Trinity High School in Bloomington, and upon her graduation, she sought to enter a Catholic nursing school. But her applications were rejected solely on the basis of race. Distraught, Ebo eventually enrolled at St. Mary’s (Colored) Infirmary Training School in St. Louis, the nation’s first and only black Catholic nursing school. In 1944, the Sisters of St. Mary, who administered the school, received federal subsidies and began training women as nurses as a part of the war effort. That same year, Ebo entered the all-black nursing school on a full-tuition scholarship as a nurse cadet. Called to religious life after her conversion, Ebo was first encouraged to enter the Oblate Sisters of Providence, the nation’s first successful order of black nuns, since no white sisterhoods in Illinois or Missouri accepted black candidates. But when Ebo learned that the Sisters of St. Mary were considering lifting their ban on black members, she held out. In July of 1946, Ebo became one of the first three African-American women accepted into the historically German order. Their admission, however, did not translate into immediate or sincere acceptance. Like many pioneering black sisters in white orders, Ebo endured unconscionable discrimination from her white counterparts and superiors. The Sisters of St. Mary built a separate novitiate for its first black candidates to ensure segregation in the dining, training and social interactions of the community. The white superiors also initially barred their black members from entering the motherhouse. On June 9, 1947, Ebo and the four other black members of the order professed their first vows in a segregated ceremony at which the archbishop of St. Louis officiated. But no experience of racism had a more formative impact on Ebo than an incident not long after she entered the order. During her father’s final illness, a white sister refused to admit Daniel, who had moved to St. Louis, into their all-white hospital, where Ebo was then working. Ebo later learned that the white sister callously dismissed her father’s pleas that his daughter was a member of the order and had been granted permission to care for him. For Ebo, her father’s death shortly thereafter in a different hospital proved almost too much to bear. It also forced her to face the ugly truth that race generally superseded faith in the minds and hearts of her white counterparts and superiors, who offered no rebuke to the offending white sister. Like many pioneering black sisters in white orders, Ebo endured unconscionable discrimination from her white counterparts. Despite such fierce resistance to her presence in the order, Ebo refused to abandon God’s call on her life or accept white supremacy as normal in the church. In addition to fighting to halt the humiliating practices of segregation in her community in the 1950s, Ebo gained a reputation for her outspokenness about racial injustice in secular society. After watching footage of the violence on Selma’s “Bloody Sunday,” Ebo told the black women employees at St. Mary’s, “I would go to Selma if I wasn’t wearing this habit.” But when her superiors selected Ebo as one of the two sisters asked to join the St. Louis delegation, Ebo, who was fearful of the violent repercussions that she might face as a black nun, initially hesitated. While Selma proved to be an important turning point in Ebo’s life, it was by no means the end of her fight against systemic racism. In 1967, Ebo became the first African-American woman to administer a hospital in the United States when she was selected to become the executive director of St. Clare Hospital in Baraboo, Wis. Sister Ebo refused to abandon God’s call on her life or accept white supremacy as normal in the church. Following the assassination of the Rev. Dr. Martin Luther King Jr. in 1968, Ebo aimed to become more active in the secular fight for racial justice and applied for a position with the National Catholic Conference for Interracial Justice in Chicago. Although she lost out on the job to a white sister, Ebo learned during the interview about an impending gathering of the nation’s black sisters in Pittsburgh, Pa. (Although Ebo’s S.S.M. superiors had received the invitation to send their black members to the historic meeting, they chose not to inform their eight black members.) In addition to confronting her superiors about their actions, Ebo wrote directly to the meeting’s organizer and secured a spot on the speaker’s platform. Like many black Catholics, Ebo knew all too well that many in the church—like those who led the desegregation protests in New Orleans and those who violently protested open housing across the North and Midwest—were just as responsible for fomenting the racial hatred that killed Dr. King as anyone else. In mid-August of 1968, Ebo joined 154 black sisters from across the country for a weeklong gathering at Mount Mercy College in Pittsburgh, Pa., (now Carlow University) to discuss their place in the burgeoning black revolution and to confront longstanding racism in their church, especially female religious life. During this first meeting of the National Black Sisters’ Conference, Ebo, who was elected to the organization’s first executive board, joined with the members of the nation’s historically black and white sisterhoods in recounting their often horrific experiences of racism in the church. When scores of black sisters began defecting from religious life in protest against enduring discrimination, Ebo vowed to remain in her order and fight the racism deeply embedded in the church. She served as the N.B.S.C. president from 1980 to 1982. In 1989, Ebo won the N.B.S.C.’s Harriet Tubman Award for her outstanding service and leadership. Ebo passed to her eternal reward at the Sarah Community in Bridgeton, Mo., on Nov. 11, 2017, which was Veterans Day. Like so many unsung black sisters in American history, Sister Antona Ebo’s herculean faith and sacrifices in the moral war for racial equality serve as painful but necessary reminders that the Catholic Church was never an innocent bystander in the history and practice of white supremacy. Segregation, like slavery, was also a Catholic tradition, and white Catholics were among the most violent opponents of racial equality and justice. Ebo’s story, however, also embodies what many scholars have called the “uncommon faithfulness” of black Catholics, and black religious women specifically, in the face of unholy discrimination. As tributes to her life continue to be published, it is imperative that we remember and tell her whole story and those of the structures of antiblack racism that painfully shaped her journey. Ebo’s life and legacy are proof that remaining silent about white supremacy and the violence that it always engenders must never be an option, especially among those who call themselves Christians. This well-researched and well-written biography of Sister Ebo has acquainted me with a hero of resistance to evils of racism in our country. I will recommend it to others, though it has at least this significant flaw: "It should come as no surprise that Ebo was among the first representatives of the church to go to the streets of Ferguson, Mo., in support of its protesting citizens following the murder of Michael Brown Jr. and the militarization of police forces against them." The Ebo portrayed by the biography, up to this statement, is a person of good sense and prudence, so it comes as a great surprise that she jumped to the (now obviously) false conclusion that Michael Brown, Jr., had been murdered, and that she went on the streets of Ferguson in support of rioters and in protest of police forces -- not militarized forces -- marshalled against just those rioters. Thank you so much. I wish that I had half the faith of saints like her. I am always curious about who are some of the nuns and priests in civil rights photos. It is good to learn about another one. Unfortunately, the Church in the United States has been behind in addressing this most egregious sin. Scholarship like yours will allow Catholics to better inform their conscience. I am so very glad to know the story of Sister Antona Ebo's life and work. She experienced racism up close in her own order, and yet she remained and worked through it. It is important for us (white Catholics) to know these people and their stories so that we might recognize our complicity in the scourge of white supremacy that continues to rage through our Church, our country, and our souls. Shannen Dee Williams is an assistant professor of history at the University of Tennessee at Knoxville. She is currently completing a manuscript for the first historical survey of black Catholic sisters in the United States, which is based on extensive archival research, previously sealed church records and over 100 oral history interviews. Sister Mary Antona Ebo’s story was the first oral testimony collected by Dr. Williams.